Do You Have to Be Religious to Join? How Do You Join AA? 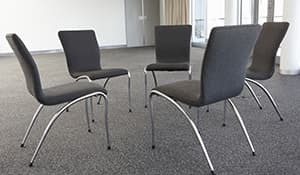 What Should I Know Before Attending a Meeting? Does Alcoholics Anonymous Help People Get Sober? The Alcoholics Anonymous (AA) 12-step recovery program is a free treatment program for people suffering from alcohol abuse and addiction. AA program participants follow a set of recovery steps to achieve and maintain abstinence from alcohol. Many people use a sponsor to help them through the process. The program uses a spiritual approach that includes a belief in a higher power. Members define that higher power in their own way—it does not have to be God. Meetings are often held in public spaces such as churches or schools. Some meetings are open to anyone who wants to attend, while others are only for alcoholics or prospective AA members. Becoming a member is free. The only requirement is a desire to stop drinking. You must be an alcoholic to join AA. But anyone can attend open meetings. “I had been in and out of AA meetings for 10 years or so and decided it was time to read my books and actually do what it said to.” – Karen R.
Read Karen’s full story and hear from others in recovery from alcohol abuse. Alcoholics Anonymous is an international organization of individuals who have struggled with drinking at some point in their lives. AA is supported and organized by its members, and it operates independently of any outside funding. It is not affiliated with any religious or political group. The organization’s goal is to promote sobriety by “carrying its message” to suffering alcoholics. All AA members remain anonymous. The anonymity removes the stigma of identification and recognition and allows participants a more comfortable experience in recovery. Alcoholics Anonymous is open to all persons regardless of age, gender or ethnicity. The only requirement to become a member is the desire to stop drinking. AA originally focused on religion as a means to sobriety. But the program has since adopted a more spiritual focus rather than a God-centric one. Many alcoholics have a hard time admitting that they can’t control their alcohol use. Once they acknowledge that they are unable to stop on their own, the recovery process can begin. Learn more about Step 1. AA believes that people with an alcohol addiction need to look to something greater than themselves to recover. Those working the steps are free to choose whatever higher power works for them. Learn more about Step 2. For this step, the alcoholic consciously decides to turn themselves over to whatever or whomever they believe their higher power to be. With this release often comes recovery. Learn more about Step 3. This step requires self-examination that can be uncomfortable, but honesty is essential in this process. The key is to identify any areas of past regret, embarrassment, guilt or anger. Learn more about Step 4. This step involves admitting to past poor behavior. Often, alcoholics will share what they wrote down during the previous step with their sponsor. Learn more about Step 5. The alcoholic admits that they are ready to have their higher power remove the wrongs they listed in Step 4. Learn more about Step 6. Every person has character defects, whether they come in the form of impatience, anger, apathy, criticism or negativity. The recovering alcoholic is not strong enough to eliminate these defects on their own, so they ask their higher power to do so. Learn more about Step 7. Alcoholics write down all of the people they have wronged through their alcoholism. The wrongs could range from large to small – from stealing from them to buy more alcohol to talking negatively behind their backs. Learn more about Step 8. Many alcoholics work with their sponsor to figure out the best way to complete this step. Making amends could include writing a letter to a person or sitting down face to face with them. Learn more about Step 9. This step involves a commitment to monitor yourself for any behaviors that may be detrimental to yourself or others and to admit when you are wrong. Learn more about Step 10. Step 10 requires you to commit to some kind of spiritual practice. That practice could be anything from prayer, to meditation, to reading scripture. Learn more about Step 11. This step encourages members to help others in their recovery. Many members become sponsors once they have completed the 12 steps. Learn more about Step 12. AA also has twelve traditions that it follows. These traditions serve as guidelines for living and working together both within AA and outside the program. AA accepts people of all faiths, even atheists and agnostics. The 12 steps of AA acknowledge that people may conceptualize a higher power in different ways and clarify this with the addition of “as we understood Him” with almost every reference to God. The “higher power” concept is about recognizing that some forces are beyond our control. AA accepts people of all faiths, even atheists and agnostics. However, nonreligious people may find themselves more comfortable in a secular 12-Step alcoholics support group or a non-12-Step addiction recovery program. Alcoholics Anonymous was founded in 1935, two years after the end of Prohibition in the United States and during the Great Depression. The co-founders, Bill Wilson and Dr. Bob Smith—both alcoholics—had a chance meeting that year. With each other’s help, they both achieved lasting sobriety. The identity of AA took shape in the following years, and it was solidified in 1939 when Bill Wilson completed the book “Alcoholics Anonymous,” which lays out the 12 step program. AA meetings can take place anywhere. But often they are held in public, accessible buildings with lots of parking, such as churches, schools, coffee shops and restaurants. Occasionally, members hold meetings in correctional and treatment facilities. However, public spaces are the more common setting for AA meetings. The basic meeting format and rules depend on the type of meeting. Speaker meetings. AA members share their experiences with alcohol abuse, how they found the program, and about their recovery through the program. This type of meeting focuses more on sharing and listening than interaction. Discussion meetings. One member speaks briefly about their own struggles with alcohol, then leads a discussion about recovery with AA and any drinking-related issue that another person brings up. This type of meeting is much more interactive than a speaker meeting. Step meetings. Everyone discusses one of the AA 12 steps. Watch this video on what happens at a typical AA meeting. AA meetings can be open or closed. Open meetings mean that anyone is welcome: both alcoholics and non-alcoholics. This is the best way to learn more about AA—what it is, what it does, and whether or not this recovery program is for you. Speaker meetings are often open, and discussion meetings are sometimes open. Closed meetings are only for alcoholics or prospective AA members. Discussion meetings are sometimes closed, and 12-Step meetings are usually closed. This ensures a tight-knit support community specifically for alcohol abuse recovery. Nobody is ever required to participate, give their name or identify themselves as “alcoholics” (though many do). AA programs want members to feel comfortable with sharing and growing together. But they also recognize that everyone does this at his or her own pace. The program focuses on abstinence. This means resisting the urge to drink and take other psychoactive or illicit substances. However, prescribed drugs such as antidepressants and other medications are permitted while in the AA program. A sponsor is a fellow AA member who has made some progress in the recovery process. The sponsor shares his or her experience in the recovery program on a person-to-person basis with another alcoholic who is working on sobriety through AA. The sponsorship aspect of the program can provide continuous, individual support for both the sponsor and the person being sponsored. This person is your personal connection to the program. They can offer phone support outside of meetings for any questions or concerns about relapse. Though not mandatory, sponsors can make a huge difference in your recovery. Working the 12 steps of AA with a sponsor has been associated with longer-lasting abstinence,1 so consider connecting with a sponsor early in your AA recovery. Becoming a member of AA is as simple acknowledging that you have a drinking problem and deciding that you want to be a member. If you have checked out the meetings and found the program to be helpful, you can simply consider yourself a member. However, AA is an organization specifically for alcoholics, though open 12 step meetings welcome people struggling with any kind of substance abuse problem. The program is free and you have no monetary or social obligation. The only requirement for membership is a desire to stop drinking, no matter how small. Meetings do take collections, though, and they encourage attendees to make donations so that AA can remain independently supported. How Many People Are in AA? AA has more than 2 million members and 115,000 groups around the world. The U.S. represents approximately 1.2 million of the world’s AA members. Can You Join if You Have Other Drug Addictions? You must be an alcoholic to join AA. However, anyone can attend open meetings. Non-alcoholics can attend open meetings as observers, but only people with a problem with alcohol may attend closed AA meetings. Other twelve-step programs, such as Narcotics Anonymous and Cocaine Anonymous, focus on specific drug addictions. Can Friends and Family of Alcoholics Join AA? Friends and family members of alcoholics may attend open AA meetings. But they may not become AA members unless they are also suffering from alcohol abuse and have a desire to stop drinking. 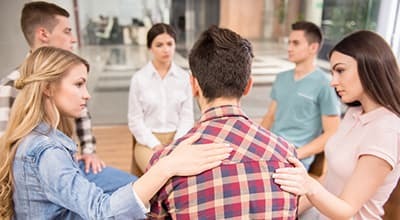 Organizations such as Al-Anon and Alateen offer support if friends and family are seeking their own recovery from a person’s drinking problem. These organizations provide comfort and community support for those coping with a loved one’s alcoholism. They also offer advice to help a loved one with recovery. Try and find out more about your local AA groups. Look for meetings where you’re likely to have some things in common with the people there. Age, gender and socioeconomic background are all factors that can provide comfortable common ground for new members. Keep an open mind. Try not to go into your first meeting with the mindset of, “I don’t have anything in common with these people.” The truth is, everyone is there for the same reason: to stop drinking. You may find that this shared struggle unites the group in a unique and powerful way. Don’t give up. If you go to a meeting and have a negative experience, try another meeting! Each gathering is different, and just because one meeting didn’t work out for you doesn’t mean AA won’t help you. Alcoholics Anonymous provides a strong sobriety support network and a sense of community. Many people find this helpful. Being in a nondrinking community of peers is much better than trying to remain abstinent around people who drink. These situations can trigger relapse. AA also makes alcoholics confront their drinking problem head-on. People in AA make amends with people their drinking has harmed—a constant reminder of the importance of sobriety. For people who are not comfortable with the spiritual aspect of AA or the 12 steps of recovery, there are alternative 12-step programs that are also free to attend. Many non-12-step programs are not religious. They use a self-help group approach, but incorporate scientific research and focus on self-reliance. Some people who attend non-12-step groups also may go to AA or Narcotics Anonymous meetings. SMART Recovery: (Self Management for Addiction Recovery): SMART Recovery is a 4-point program based on cognitive behavioral therapy and seeks to empower the individual through education and practical techniques. It is present-focused and does not use the term “disease” when referring to addiction. Attendees may use medications, which are not encouraged in AA. Secular Organizations for Sobriety: SOS is made up of independent self-help groups that emphasize rational decision-making and use a list of Suggested Guidelines for Sobriety that make sobriety a priority. LifeRing Secular Recovery: Members attempt to tap into their Sober Self (the part of them that seeks to become sober), stay positive, and focus on the present. They share experiences and support each other. The individual is expected to create their own path to recovery. To find a local AA meeting, contact your local AA office. The list of local meetings can also be found on the AA website. Recovery.org is not affiliated with Alcoholics Anonymous or any of its subsidiaries. This information is provided as a resource for those seeking third-party information.
. Tonigan, J. S. & Rice, S. L. (2010). Is it beneficial to have an Alcoholics Anonymous sponsor? Psychology of Addictive Behaviors, 24 (3). 397-403.
. Kaskutas, L.A. (2009). Alcoholics Anonymous effectiveness: Faith meets science. Journal of Addictive Diseases, 28 (2). 145-157.
. Moos R.H. & Moos B.S. (2006). Participation in treatment and Alcoholics Anonymous: a 16-year follow-up of initially untreated individuals. Journal of Clinical Psychology, 62 (6). 735-750.
. Connors G.J., Tonigan J.S. & Miller W.R. (2001). A longitudinal model of intake symptomatology, AA participation, and outcome: retrospective study of the Project MATCH outpatient and aftercare samples. Journal of Studies on Alcohol, 62. 817-825.
. Ferri, M., Amato, L., & Davoli, M. (2006). Alcoholics Anonymous and other 12-step programmes for alcohol dependence. Cochrane Database of Systematic Reviews, Issue 3.
. Project MATCH Research Group. (1998). Matching alcoholism treatments to client heterogeneity: Project MATCH three-year drinking outcomes. Alcoholism: Clinical and Experimental Research, 22 (6): 1300-1311.
. U.S. National Library of Medicine. (2018). Alcohol withdrawal.